We are to always respect our elders whether or not if it’s our parents. One day you will grow up and be respected by younger people just like them. Take the time to listen to their experiences and wisdom to grow in knowledge. If you take the time to listen to them you will see that many elderly people are humorous, informative, and exciting. Never forget to take care of your elders helping them with what they need and always be gentle showing loving kindness. Respect your elders. 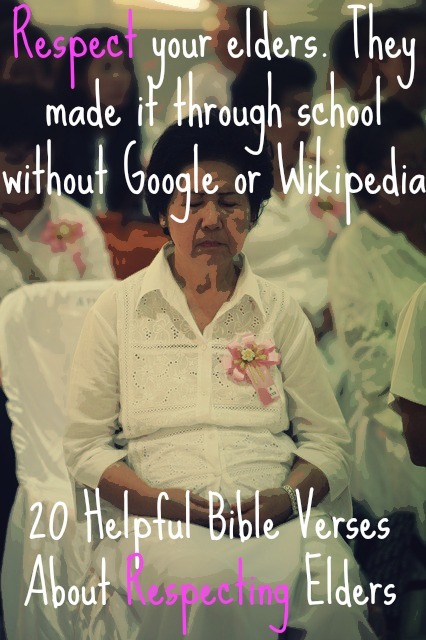 They made it through school without Google or Wikipedia. Give elderly people your time and assistance. Visit them in nursing homes. No slang. Use manners when speaking to them. Don’t talk to them how you would your friends. Listen to them. Listen to stories about their life. Be patient with them and be a friend. 1. Leviticus 19:32 “Stand up in the presence of the elderly, and show respect for the aged. Fear your God. I am the LORD. 3. Exodus 20:12 “Honor your father and your mother, that your days may be long in the land that the Lord your God is giving you. 5. Ephesians 6:1-3 Children, obey your parents in the Lord, for this is right. “Honor your father and mother” (this is the first commandment with a promise), “that it may go well with you and that you may live long in the land. 6. Timothy 5:1-3 Never speak harshly to an older man, but appeal to him respectfully as you would to your own father. Talk to younger men as you would to your own brothers. Treat older women as you would your mother, and treat younger women with all purity as you would your own sisters. Take care of any widow who has no one else to care for her. 7. Hebrews 13:17 Obey your leaders and submit to them, for they are keeping watch over your souls, as those who will have to give an account. Let them do this with joy and not with groaning, for that would be of no advantage to you. 8. Job 32:4 Now Elihu had waited before speaking to Job because they were older than he. 9. Job 32:6 And Elihu the son of Barachel the Buzite answered and said: “I am young in years, and you are aged; therefore I was timid and afraid to declare my opinion to you. 10. 1 Kings 12:6 Then King Rehoboam consulted the elders who had served his father Solomon during his lifetime. “How would you advise me to answer these people?” he asked. 11. Job 12:12 Wisdom is with the aged, and understanding in length of days. 12. Exodus 18:17-19 “This is not good!” Moses’ father-in-law exclaimed. “You’re going to wear yourself out—and the people, too. This job is too heavy a burden for you to handle all by yourself. Now listen to me, and let me give you a word of advice, and may God be with you. You should continue to be the people’s representative before God, bringing their disputes to him. 13. Proverbs 13:1 A wise son hears his father’s instruction, but a scoffer does not listen to rebuke. 14. Proverbs 19:20 Listen to advice and accept instruction, that you may gain wisdom in the future. 15. Proverbs 23:22 Listen to your father who gave you life, and do not despise your mother when she is old. 16. 1 Timothy 5:8 But if anyone does not provide for his relatives, and especially for members of his household, he has denied the faith and is worse than an unbeliever. 18. Matthew 7:12 “So whatever you wish that others would do to you, do also to them, for this is the Law and the Prophets. 20. Hebrews 13:16 And do not forget to do good and to share with others, for with such sacrifices God is pleased.